While I may not be able to remember what I did yesterday or what I need to do in ten minutes; I can clearly remember a Christmas card that I fell in love with some fifty years ago. Glitz and glam ruled the decorating roost in the early 60’s. Everything was either pearlized, flocked or glittered … or some modernized combination of the three. The card that has had such a grand place in my memory was a pearlized green that was bordered by a frame of glittered holiday red. 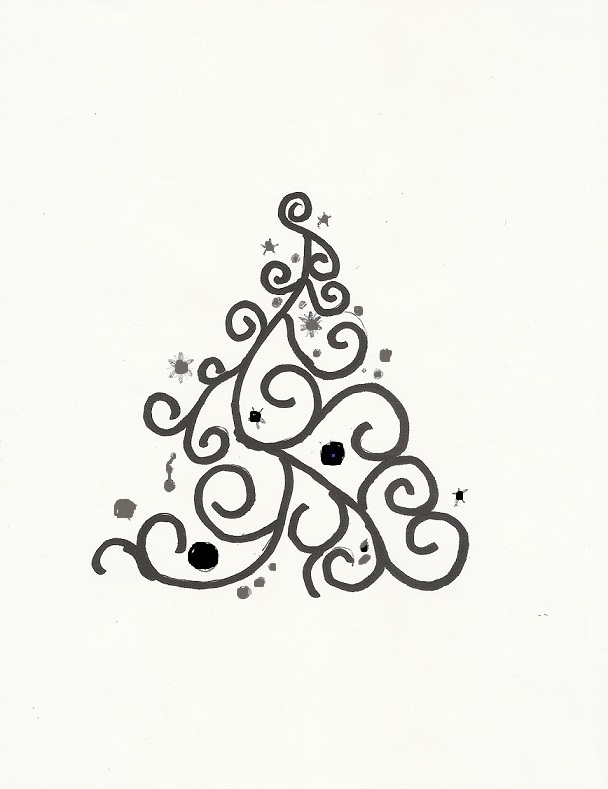 The image at the center was a swirling, curling flocked and glittered white Christmas tree. This is the tree that inspired the embroidered design that is being offered in this writing. Assorted buttons, beads and charms to your liking. Sewing thread, needle and glue and / or spray adhesive. Copy and resize the design as you like. Transfer the design to your fabric. The dots and stars were my schematic of where I “thought” I wanted the charms … as you can see, I didn’t follow that schematic. Embroider the design. I used a back stitch with the green perle cotton. 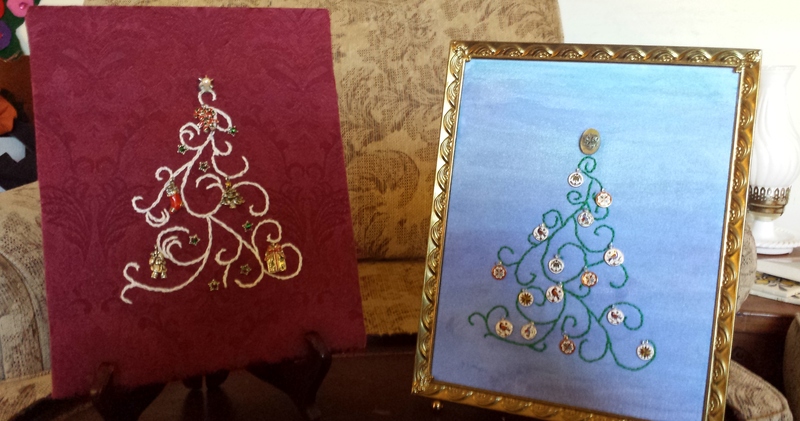 The white tree needed a bit more “oomph,” so I used a split stitch. After completing the embroidery, lay the fabric face down on a padded surface and lightly press. Sew / glue on charms as desired. Raid your button stash, jewelry finding stash, broken jewelry pile, ect. Nothing is beyond the boundaries of the glitz that you can add to your tree. Insert into frame. Note that this will create a very thick piece and sliding it into some frames may take a bit of patience and creative finagling.